Florida Oranges come in many different varieties, sizes, and colors. But are any of the oranges we grow really the color orange? Are some oranges more “orange” than others? We’ll need to start by answering the question: What exactly is the color “orange”? The color orange also describes the secondary color created by mixing equal parts of red and yellow in the traditional Red-Yellow-Blue color model. This places the true color of orange right in the middle, containing no more red than yellow. Now, what about the fruit? Where does that fall? Well, there are many different varieties of oranges, and even oranges of the same varieties vary slightly in coloration not just from batch to batch, but from the bottom of each orange to the top. Most oranges are very close to a color called “Orange Peel”. There are exceptions of course, but Orange Peel would be the color that you typically think of when you think of Florida Oranges. Let’s play a little game. Can you identify the color Orange Peel? 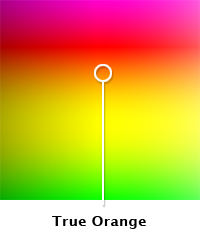 The image below shows several colors on the orange spectrum. Which one is the color Orange Peel? Is it more yellow or more red than true orange? For bonus points, see if you can identify these other colors as well: Tangelo, Pumpkin, Carrot, Tangerine. Please Note: Our little game only works if your computer screen does a good job displaying colors! Older computer screens may not show these colors correctly. Please share on Facebook and Twitter so others can take the test! Surprisingly enough, carrots are actually closer to True Orange than your typical orange. Compare the different kinds of colors you see the next time you shop for oranges!